Featuring a light red steel wire planter basket for materials, planters and more, a 360 degree swiveling steel seat, and an extendable steering handle, this is the perfect addition to your garden and landscaping tools. 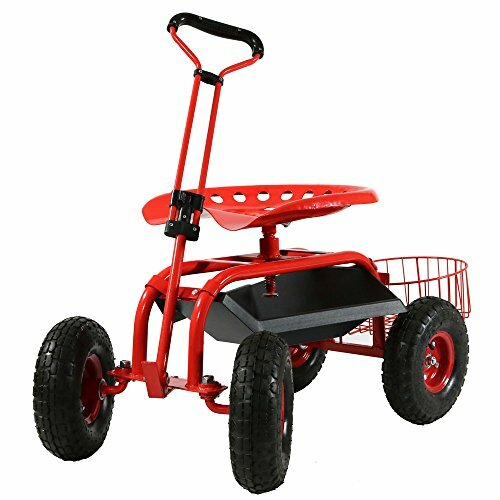 This utility cart is engineered to last with its heavy duty powder coated steel frame, steel axles, and pneumatic tires with dark red coated rims. Also features a convenient plastic tray for holding your tools. The extendable steering handle makes it so you can easily pull the cart across the yard to where you need to work. Additional dimensions: Wheel dimensions: 10 inch diameter x 3 inch wide with 12 inch distance between wheels. Tool tray beneath seat is 18 inch long x 3 inch deep x 16 inch wide at the widest point and 7 inch wide at narrowest point. Basket is 11 inch diameter x 4. 5 inches. Seat height ranges from 16. 5-22 inches. Steering handle is extendable from 20-29. 5 inch long x 7. 5 inch wide and sits 6. 5 inches above the ground. DURABLE DESIGN: Heavy duty yard cart frame is made from powder coated steel with a extendable handle, removable light round planter basket, and coated tire rims. It also features a plastic utility tray beneath the seat.